Fiberglass reinforced panels (FRP) protect walls from impact and moisture damage. To achieve optimal wall protection, the FRP wall panels must fully bond to the wall's surface. Voids between the FRP and the wall surface cause the FRP to release from the wall. This allows moisture to penetrate the seams of the panels, causing moisture damage. Using the proper tools to install, cut and drill the FRP will keep the wall panels in place. 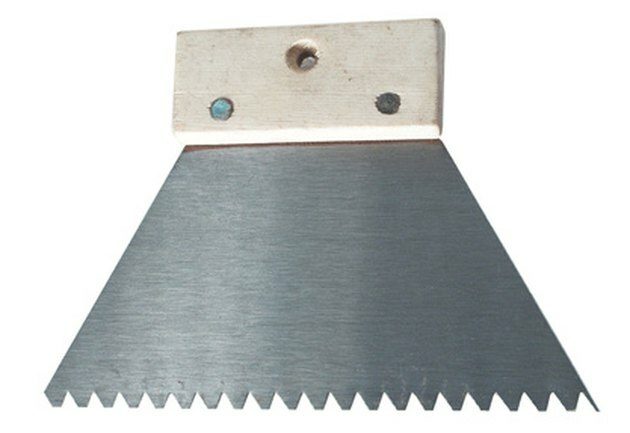 V-notched trowels spread the FRP adhesive to the proper depth. Scrape loose paint and debris from the wall. Apply joint compound to low spots on the wall. Sand the wall surface to remove high spots that will interfere with the installation of the FRP panel. Clean loose debris from the wall. Measure the length of the wall. Divide the measurement by the width of an FRP panel (48 inches.) If you have a remainder, divide the number by two. This will give you two equal cut panels. Mark the divided remainder length onto a sheet of FRP. Align the drywall square with the pencil mark and extend the line along the sheet of FRP. Measure any obstructions that require a hole. Mark the location of the hole on the FRP sheet. Extend each mark to make a rectangle for the required hole. Drill a 3/8-inch hole in the center of the required hole. Slide the blade of the swivel-head shear into the drilled hole. Cut to and then along the pencil marked lines to remove the material. Cut along the marked pencil line to cut the FRP sheet to size. Measure back from one corner (if applicable) 48 and 1/8 inches and mark with chalk. Extend the mark to place a reference line on the wall. Cut the nozzle of the silicone caulk tube with the cutter located near the handle of the drop-in caulk gun. Place the open caulk tube in the cradle of the caulk gun. Run a bead of silicone caulk onto the backside of a length of corner mold. Press the corner mold onto the corner of the wall. Make a mark at 1 inch, 16 inches, 32 inches and 47 inches across the width of the FRP sheet. Place vertical marks at 1 inch and then every 16 inches down the sheet (five times). Place a final mark 1 inch from the opposite end of the sheet. Extend each mark to mark 32 hole locations across the sheet. Drill a 3/8-inch hole at each location marked by a plus sign. Spread FRP adhesive on the back of the FRP sheet with the V-notched trowel in a cross-hatch pattern. Slide one end of the FRP sheet into the installed corner molding. Pull the rear edge of the sheet back to the 48 1/8-inch chalk line. Press the FRP sheet against the wall. Roll over the FRP sheet with a laminate roller to remove air from behind the sheet. Slide a nylon drive rivet into one of the top drilled holes in the FRP sheet. Knock the drive pin into the rivet with a hammer to hold the FRP sheet in place. Install one nylon drive rivet into each hole. Repeat the procedure of marking, cutting and drilling each FRP sheet until you cover the wall with FRP sheeting. Apply FRP adhesive to the back of the FRP sheet in a cross-hatch pattern with the V-notched trowel. Slide one edge of the FRP sheet into the installed molding. Align the rear edge of the FRP sheet with the 48 1/8-inch chalk line. Press the sheet against the wall. Remove the air from behind the FRP sheet with a laminate roller. Run a bead of silicone on one side of the divider molding. Slide the caulked side of the divider molding over the raw edge of the FRP sheet. Do not push the divider molding tight onto the FRP edge. Place caulk on the inside lip of the cap molding. Slide the cap molding flange over the top edge of the FRP sheet. Press down on the cap molding to finish the top edge of the FRP sheet. Run a bead of silicone caulk onto the side of the divider molding before installing another sheet of FRP.